The BR’s Team entered three (3) runners in the 100K Solo Run—Mamerto Corpuz, Esmeraldo Ondoy, and Ellen Tolentino; and one team for the 100K Relay Run consisting of Cresenciano Sabal and Reynaldo De Los Reyes. Three (3) of our runners registered in the 20K and 10K events. Our BR Team won 1st Runner-Up (2nd Place) in the 100K Team Relay (Cresenciano Sabal & Reynaldo De Los Reyes); Mamerto Corpuz won Third Place in the 100K Solo Race; Esmeraldo Ondoy won Fifth Place in the 100K Solo Race; while Ellen Tolentino was the Female Champion in the 100K Solo Race and Seventh (7th) Overall; Ailene Tolentino also won as the Female Champion in the 10K Trail Race. The BR’s Runners brought home five (5) Belt Medallions; P 5,000 worth of Gift Check and P 50,000 Check to be encashed this Friday. All of these prizes went to the runners. Spending Eleven Thousand Pesos (P 11,000.00) to these elite runners was a worthy investment for their effort, experiences, and the belt medallions/cash prizes they received. 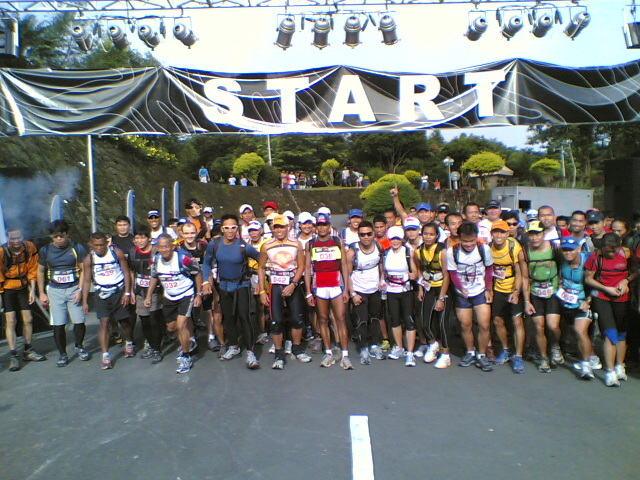 I was happy to receive the news about how the BR’s Team runners’ accomplishments in the TNF 100 from Captain Espejo (who was constantly sending me text messages) and from the other runner-bloggers who joined the race. I was happier with the thought that I was made to be “an instrument” for these deserving elite runners to experience ultra trail running with the prestigious The North Face as the main sponsor. 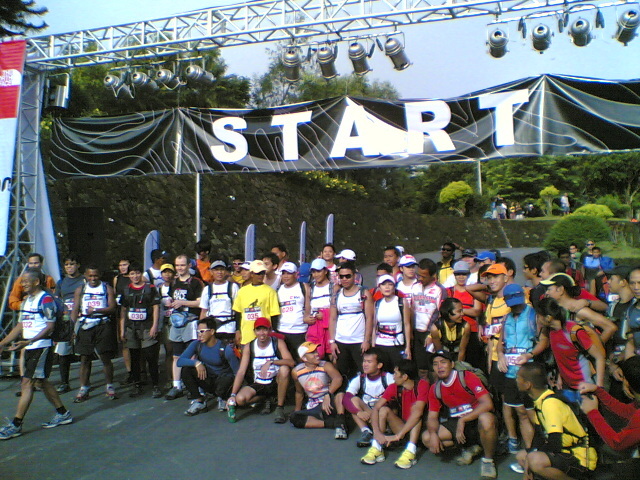 Eighty-four (84) ultra trail runners for the 100K Solo run and 100K Team Relay run started the TNF 100 Race at 7:30 AM on 26 July 2008 with team runners from Singapore and Hong Kong. 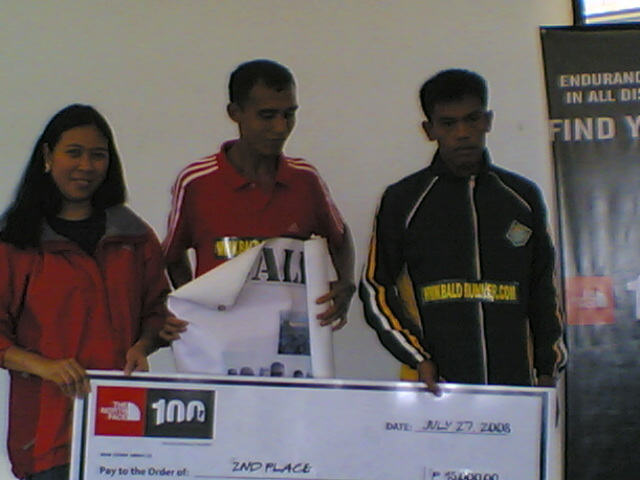 Cresenciano Sabal (right) and Reynaldo De Los Reyes (middle) won 1st Runner-Up in the 100K Team Relay Run finishing 12 minutes behind the Champion Team. 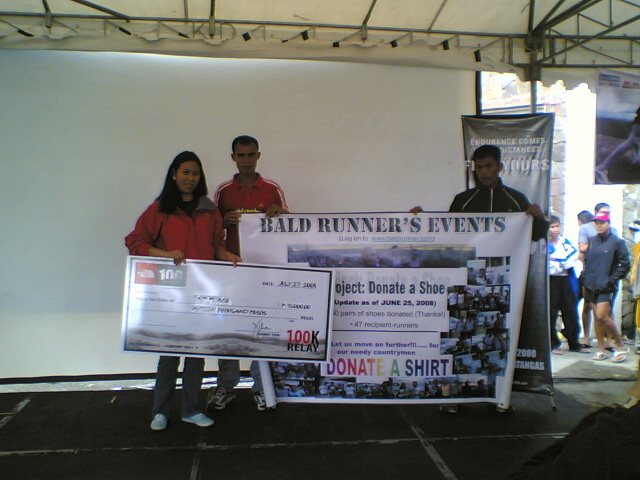 They received P 15,000 check as their cash prize. Having registered on line a week before, the following is my confirmation letter to participate in the Bulldog 50K Trail Ultra Run. Please note that this letter was sent to my e-mail address one month before the race day, 23 August 2008. In this letter is a detailed information and instructions to follow on the conduct of the race. Here is a comment of Nolan which he posted on my “Charity Fund” Page which makes his running workouts & road races more significant and meaningful to himself and to others who are in need of our help and support to ease their present conditions. I am posting this comment in my blog to inform others that runners, aside from having strong and healthy hearts, have a caring heart for others. Obviously you’re enjoying your stay and your runs there in the US. Good for you Sir, but we’re also missing the Bald Runner in the races here. Sir, just wuld like you to know that I’ve been one of the runners who followed your lead in aiming for 1000K. I have only logged in 300+ kms though as of this date. I am also giving in 5 pesos for every kilometer that I ran (i’m not as rich as you, Sir , and I intend to donate this to a charity institution come christmas time. However, due to the typhoon Frank, I also decided to donate the fund that I already raised for the 300+ Kms that already logged in. Aside from my own fund, I also asked some of my friends to join me with this project; and so far we have already raised 18 thousand pesos+. I already bought some goods amounting to 13800+and brought it to ABS-CBN’s Sagip Kapamilya. Our next donation will be school supplies as requested by the Staff in the donation center. I am informing you this Sir, because you have been my lead with this project. In spite of the of the difficult times nowadays, we actually feel this is the best times to give to those who are in need, and especially to those that were greatly affected by calamities. I’ll continue the run and the funding up to christmas time, Sir. I’m aming that will just be in time for the completion of my 1000K. More power to you Bald Runner. We’ll see you soon. According to Sun Tzu, the Chinese Strategist, that if you know yourself and you don’t know the enemy, you are are not sure to win in every battle you fight; but if you don’t know yourself and you know the enemy, in every battle you incur some casualties and “lapses” and chances of winning the battle will be costly; but if you know yourself and you know the enemy, in every battle you are sure to be victorious! Since I am a warrior runner, I should be able to know the enemy and be able to conquer it victoriously. Knowing myself as capable and ready to run my first ultra trail run (hopefully), I have to know the enemy, the Bulldog Trail Course. So, this morning, my son and I went to the Malibu Creek State Park and orient myself with the trail and route of the race. My son is very efficient on locating places, using the Internet to get from Point A to Point B, and driving to any place where I would want to go. So, we woke up at 7:00 AM of Saturday, took our breakfast, changed to our running gear, and prepared our water supply and we were out of the house before 8:00 AM. We took the CA Highway 110 South and then took the Interstate Highway 10 West towards Pacific Coast Highway (CA Highway 1) and later reached the City of Malibu. We passed by the famous Pepperdine University and we were on our way going east towards the mountains. 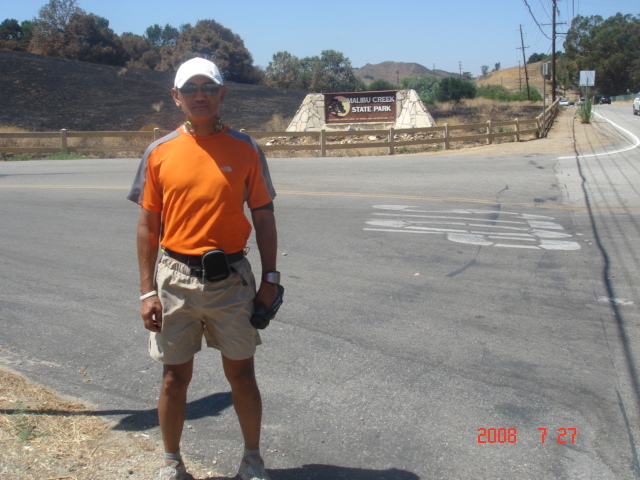 In a few minutes, we were in Las Virgenes Road towards the entrance of the Malibu Creek State Park. We paid $ 8.00 for our entrance and parking fee to the said park. It was almost 9:00 AM when we entered the park. We prepared our water supply and tried to look on the map at the park the trails we are going to take as part of the Bulldog Trail Run. It took us sometime to orient ourselves but with the help of one of the Park Rangers (an old guy) and explaining our route in detail, we were able to get some basic information about the trail routes in the park. I’ve observed that there were hikers and mountain bikers preparing to enter the trails around the park. 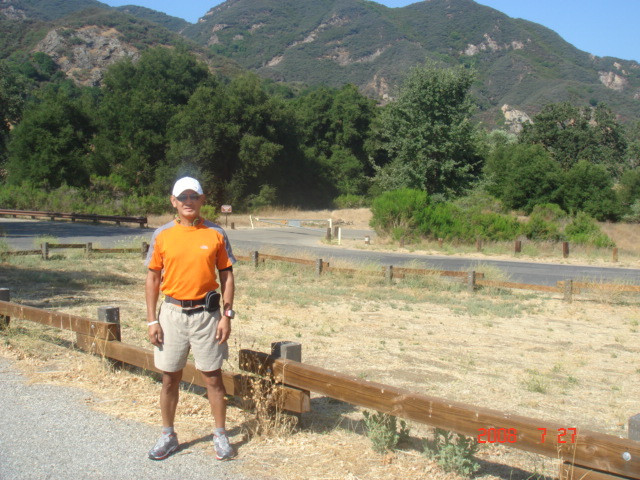 Since this was our first time to run on a trail in California, I told my son that we came here to the park to orient myself and have a feeling on how to run trails and we’ll make this run as a tour of the place where we have to stop for a while to take some pictures of the surroundings and the route. Once we hit the trailhead of Crags Road, we started our slow run. 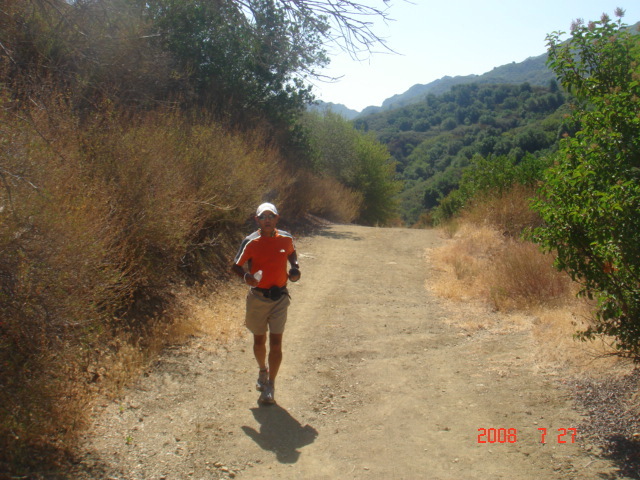 I was surprised that the wide road became narrower, only to find out that we were actually running on the rocky portions of the Malibu Creek without any water. And then the trail would become wider as a dirt road but the elevation is slowly increasing. We continued to slowly run at the Crags Road until we reached the intersection with Bulldog Trail Road, which was turning to the left. We stopped briefly on this part to take some pictures. 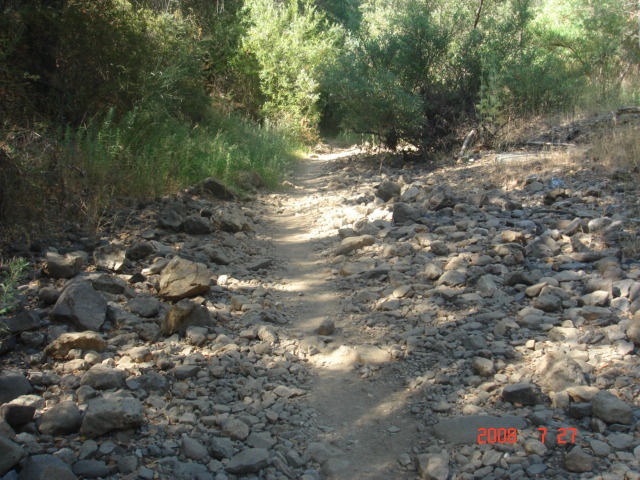 This is the rocky part of the trail along the Malibu Creek without any water. I could just imagine all the runners lined-up along this narrow trail during race day. This is where the start of most of the trail going up to the highest peak of the mountain. This part is the intersection of Crags Road and Bulldog Road which is about 4 kilometers away from the Starting area. From the intersection of Bulldog & Crags, the trail road becomes higher and higher in its elevation and the heat of the sun was already hitting us. I think the temperature in the area was already at 85-87 degrees Fahrenheit and we started to sweat and breath heavily while jogging. We continued our slow run along the way and stopping by places where I want my pictures to be taken by my son. Sometimes we had to stop when there are intersections along the way and most of the time we take the wrong trail and we had to go back to the bigger trail or “fire road”. The first 6-8 kilometers from the Crags-Bulldog Trail intersection were uphill and it was really hard for me as this was my first time to run an uphill climb with such a long distance! At this point we met two mountain bikers who just stopped for some rest and another mountain biker whom we met at a higher elevation along a curve which surprised me and gave him the left side of the road which he appreciated by saying “Thank you”. 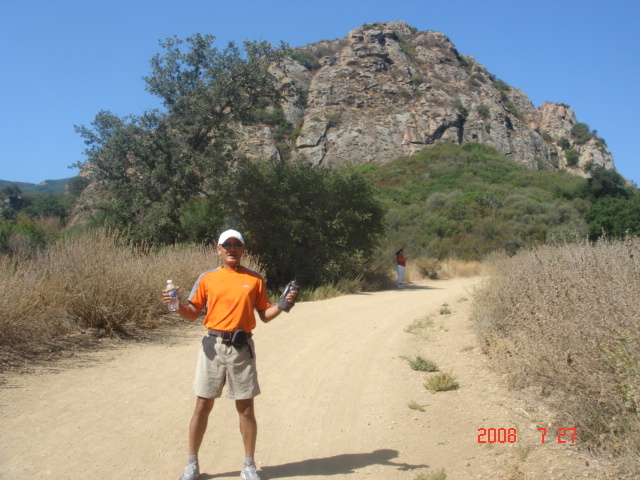 Running on trails in California made my throat very dry in almost every 100-200 meters running uphill and I have to take a sip of water from my water jug. It was my first time to experience such situation. In the Philippines, I could run 12 kilometers without drinking any water but running trails here is entirely a different experience. I hope I will be able to acclimatize with more practice runs on the said route. This is another portion going to the peak of the mountain through the Bulldog Trail and at the top of the road was where I met a mountain biker whom I gave more way on my left as he curved down the trail. What I liked about my first trail run in the mountains here in California (except my previous training runs at Griffith Park and Mt Hollywood) was the view of the surroundings—different rock formations in different colors; the view from atop the mountains with the sight of the Pacific Ocean in the west and mountains/vast lands and communities saddled on top and on the sides of the mountains in the east, north & south; the clean air that I breath even if it was hot; and the refreshing wind coming from the Pacific Ocean. My new M Arnuva 50 Boa Trail Shoes from The North Face was very versatile and responsive during my trail run most especially during the downhill part of the course. It gave me the much-needed traction on the road to prevent me from sliding on the ground. 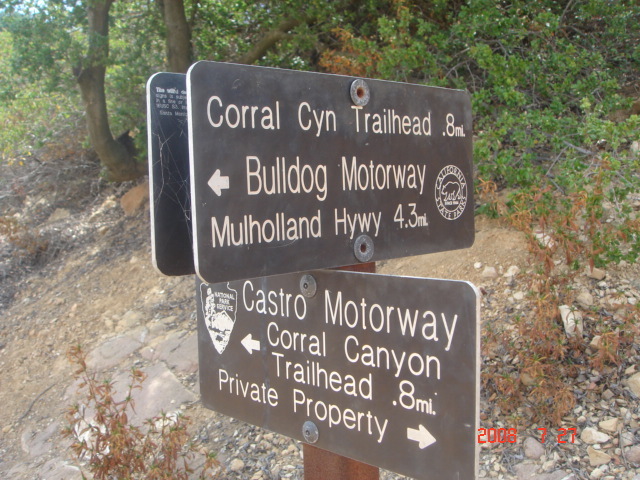 At the end of the Bulldog Trail, we started to brisk walk and slowly jog until we reached the Corral Canyon Trail where we saw two white guys riding on two big horses going towards us. We had to give way to these horsemen and they uttered words of encouragement for making up to the peak of Bulldog Trail. This is what I liked when I ran for my first time in this trail—ALL The People you meet along the trail would greet you (Good Morning/Good Afternoon or say Hi!) and smile at you. We had to do the same too to other people we met along the way. These are the directional signs along the intersection of each trail along the route. In between such trails, seldom you could see directional signs and there were times that we got lost along the way. On our way going down the Corral Canyon Road, we met a family and kids on mountain bikes going to the peak of the mountain (about ten persons). The last kid (12-14 years old boy) of the biking group just dropped his bike and just stopped and stand on the trail while the other kid was shouting at him to continue to carry/push the bike up to the peak of the mountain. I was smiling while I was passing this kid who was almost crying and full of sweat because of being tired or due the effect of the heat. A pose at the TV “Star Trek” shooting location. My son, John, ran the whole one-half of the entire loop without his shirt and he was “sunburned”. The Corral Canyon Road was not all downhill ride as there were other uphill roads and we had to walk again. 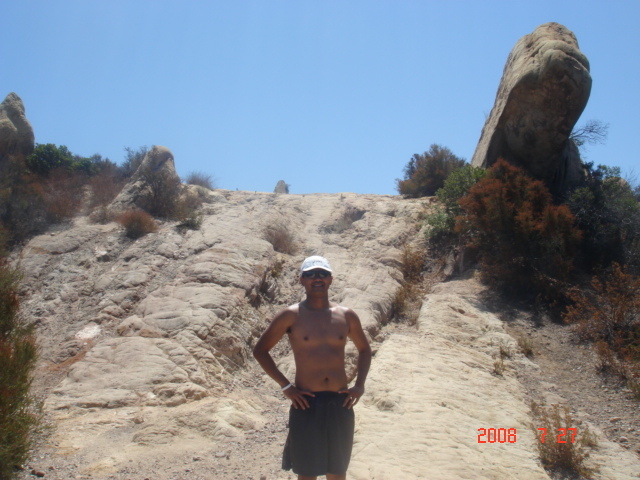 We went through rock formations which according to my son were used as filming locations of the TV series “Star Trek”. We took some pictures and we saw a couple walking ahead of us who was familiar with the trail. We even saw an Oriental woman (Japanese or Korean) whom we tried to ask for directions but she did not understand us! Anyway, we just followed the wider trail road and started alternately walking and jogging. I had to pee at Kilometer # 16. This was part of the Corral Canyon Trail-Backbone Trail which was going uphill where three other guys running the trail overtook us. At the middle of the stretch of the Corral Canyon Road, two big guys who were consistently running overtook us and after a couple of hundred meters another one passed by us and we could see them running farther from us. We just maintained our brisk walking and I was getting worried because our water supply was about to be gone. I had only one-half full of my water jug (half-liter full) with almost 10 kilometers back to the base camp and my son had the same water supply on his water bottle. 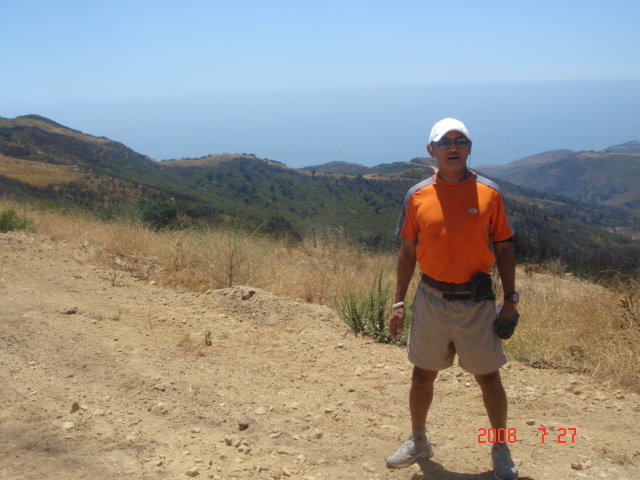 This pose was taken at the peak of the Corral Canyon Trail /Backbone Trail before we ran downhill towards the Las Virgenes Road. The background is the Pacific Ocean and we were about 8 kilometers aways from the Finish Line. When we reached the downhill portion of the route, I started to run and just let the weight of my body carry my feet along the route. My pace became faster and faster until I was able to overtake the last guy who overtook us. 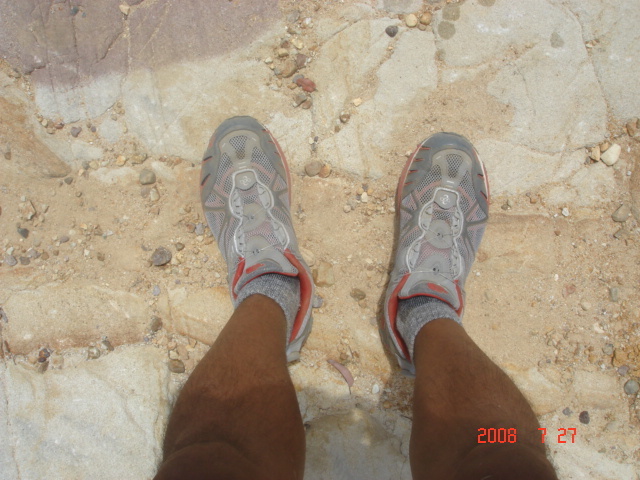 I realized that using a specific trail shoes is a must in this kind of situation. An ordinary running shoes could not hold the feet and body in a downhill trail with all the loose rocks and soil on the ground and I can say that running shoes lack the traction needed to prevent from having a slip or slide along the route. My fast downhill pace made me overshoot to the direction of a small trail that leads to a narrow Tapia Trail and I ended to a secured gate of a Water Reclamation Facility ( Water Filtration Facility) at Tapia Camp which is a Restricted Area. I have to go uphill for about 100 meters to reach the detour trail and waited for my son who was having a problem with his shoes (he was using a Nike cross-training shoes which he used for his alternate training). While waiting for my son on a shaded portion of the trail, the white big guy whom I overtook was about to run the wrong way when I told him that he has to take the trail where I was standing. The guy stopped by where I was waiting for my son and we had a brief chat. 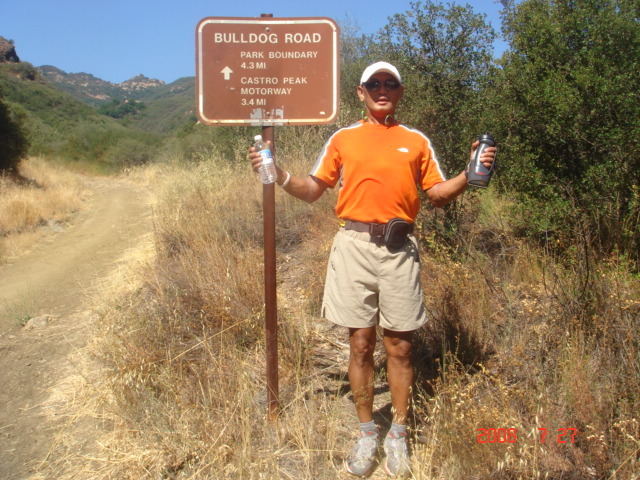 I found out that he is with a group of runners from Simi Valley who will be running the Bulldog 25K Trail Run and it is his first time to run along the 25-K loop. He told me that there is another guy from his group who is at the back and he is trying to wait for him. Anyway, it was nice talking to him and his name is “Bob”. I told him about this blog! Later, I saw him and his running mates/friemds at the parking lot of the camp after finishing my tour of the Bulldog Trail Run route. At the end of the Corral Canyon Trail, we met two guys in backpacks going up the trail. We also saw a Restroom and stopped there to refuel ourselves with our water supply. 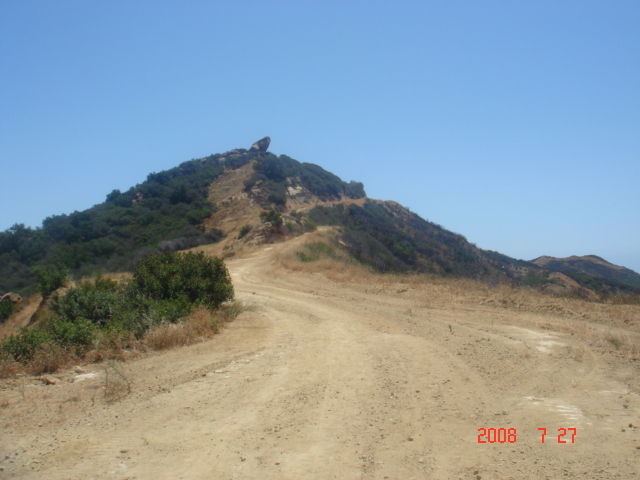 We got lost on this part of the route and we decided to run along the Las Virgenes Road until we hit the entrance of the Malibu Creek State Park which was another 2 1/2 miles of brisk walking and jogging as this paved and busy road was going uphill. We learned later on the map that we should had followed the single trail that goes up towards the mountain for another distance, the same distance as the one we took along the Las Virgenes Road, before the trail ends at the Parking Area of the camp. 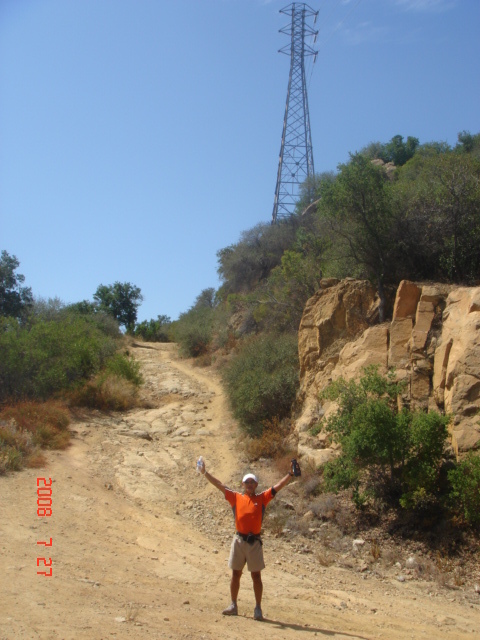 My last pose at the entrance of the Malibu Creek State Park before we ended our practice run. We ran & walked along the Bulldog Trail 25K route of about 25.5 kilometers in 4:45:40 hours with an accumulated ascent of 4,593.6 feet (1,392 meters) and descent of 4,217.4 feet (1,278 meters). Our run started at an elevation of 600 feet (182 meters) and reached the highest peak of 2,528 feet (766 meters). My practice run and orientation tour of the Bulldog Trail was a nice experience and a good feel of “knowing the enemy”. I will be back on the next weekend after the San Francisco Marathon for another practice run and be able to hopefully simulate the race with more consistent running, lesser brisk walking and more water to carry. I am beginning to love trail running in the mountains! The Historic Filipinotown is just a five-minute drive to Downtown Los Angeles and very accessible to distinct and “must-see” places in the city. The streets that surround and intersect the place has lots of low hills/ascending & descending portion where I could do my easy and moderate hill workouts. I had my 10-km run on these hilly streets, increasing my pace on the uphill and easily jog on the plain area for at least 3-minute recovery run. I made eight (8) repetitions of these uphill runs in the different parts of the district and I miss my running days in the hills of Jamindan. With this run, I was able to finish and reach completion of my “1,000K Club” which I started last 01 March 2008. It took me 4 months and 3 weeks to run such distance with an average run of 52.63 kilometers per week or 32.9 miles per week. It is a very low mileage and below the average mileage for a basic or intermediate competitor but I am glad to have reached this accomplishment. 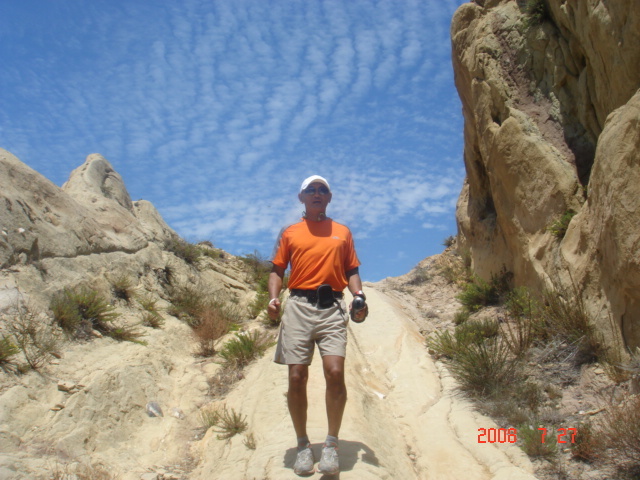 My problem with my “gout/arthritis” had diminished my goal to increase my mileage after my retirement. However, it was a blessing in disguise not for me to abruptly increase my mileage as I could had incurred much damaging injuries to my knees, leg muscles and achilles tendons. I had officially started my training for my first ultra trail marathon this week and slowly increasing my mileage and making my long steady runs at a slower pace. I had also brought back hill training to my workouts and maintain a regular hydration during runs, taking a sip of water every kilometer that I ran. I hope I will be well-prepared for the challenge in my first ultra run in 4-week preparation. Going back to my “1,000K Club”, as a reward, I treated myself with a shopping spree at The North Face Store in Beverly Hills (the only TNF store in Los Angeles!) and later at the Patagonia Store in Pasadena, California. I got “Sale” prices for the Summer Clothing apparel (about to be removed from the displayed items) and got new items for the Fall Clothing line which were newly displayed for the week. I guess, I was able to save at least 40% of the price if I buy the goods in the Philippines and of course, have to wait a few months before such items will be available in Manila. I am not sure if I can buy Patagonia, REI, Columbia Sportswear, ASICS apparel, Salomon, Pearl Izumi, or Under Armour in Manila in the near future. And now the best part, my wife ordered me a special gift, a complete P90X program, which I will try for my strength and endurance training program. I expect the order to arrive this week or early next week. I am continuing my “1,000K Club” and aiming for another “1,000K” and we’ll see where my training/running will bring me. Remember, running is about patience, persistence, consistency and “positive” thinking. And always reward yourself for any accomplishment you have done. “The warrior runner understands that racing is a roller coaster and learns patience to ride the ups and downs; and enjoys running for the pleasure it gives”—From the book “Running Within” by Jerry Lynch & Warren Scott.